In honor of this weekend being the 4th of July (already!? ), I just had to share something appropriately themed. The rhubarb in my backyard is just flourishing, so I have been trying to use it all before it goes by. Strawberries are just coming into season here (it's been a hard, cold spring), so, I knew that a strawberry rhubarb pie was in order! After all, they are the perfect pair! Preheat the oven to 400ºF. Have ready a rimmed baking sheet. On a lightly floured surface, roll out one half of the pie crust to fit into a 9-pinch pie plate. Trim excess and place in the refrigerator while preparing the filling. In a large bowl, combine all of the ingredients. Gently toss until the the fruit is well coated. Place the filling in the bottom crust in the pie plate. Place the butter pieces over the top of the pie. Roll out the other half of the pie crust. 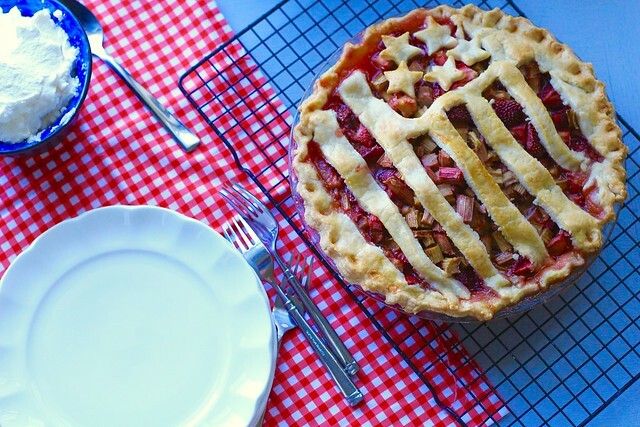 Cut into strips if doing a lattice top, leave whole with just a few slits cut for steam vents, or make a flag top by using a mini star cutter and cutting out a few stars from one "corner", then place the crust over the pie. Cut out a square where the stars were cut out, then place the cut-out stars there. To make the stripes, cut out strips, leaving a space between each one. Trim excess, and crimp the edges with your fingers or a fork to seal. Lightly brush the egg wash over the pie. 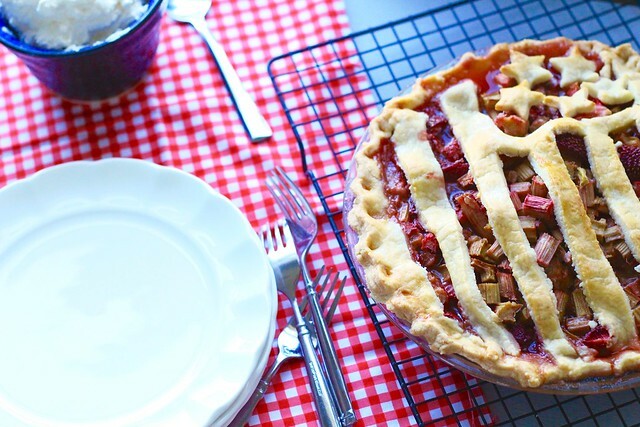 Place the pie on the baking sheet and place in the oven. Bake for 15 minutes, then reduce the temperature to 350ºF, and bake for another 45-50 minutes, or until the filling is bubbly. If the crust is browning too quickly, cover the edges with a tinfoil ring. Let cool before slicing. Serve with whipped cream or vanilla ice cream. Store covered in the refrigerator for 4-5 days, re-warming before serving.